I woke up today and seen something I haven't seen in a while... Snow. For me, cold=chapped lips. I'm a Summer baby- so this is probably one of the worst times for me because my skin gets really dry. I have to do a lot to get comfortable during this season. I was really excited when the Mary Kay Satin Lips® Shea Butter Balm & Sugar Scrub ($12.00) showed up on my doorstep. At first glance I'm not going lie, I wasn't sure how it would stack up to the original: Satin Lips mask. Which I might add is extremely popular. We all know the value of Shea butter? Right....Did you know that Shea butter is actually a fat extracted from the nut of the African shea tree. Satin Lips® Shea Butter Balm is created with not only with shea and jojoba butters but also with the flavor of white tea and citrus. Satin Lips® Shea Sugar Scrub uses real natural sugar crystals to delicately polish your lips. Also found in the Shea butter mixture: sunflower oil and Vitamin E. Gently massage this confection onto lips for one minute and whisk away dryness. Lip texture is immediately improved and lips are left looking revitalized. 1. Exfoliates with the Shea Sugar Scrub and let the natural sugar crystals do the work. 2. 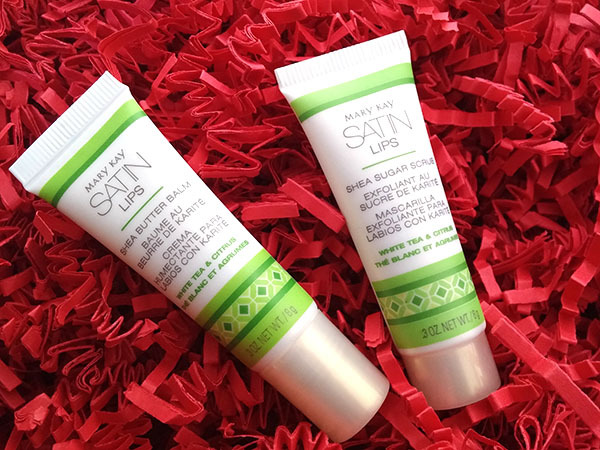 Use the Shea Butter Balm to finish off with smooth and conditioned lips. How do you feel about lip scrubs?